You can modify the appearance of the Diagram Toolbox pages in several ways, through the Toolbox context menu. Select the 'Hide Labels' (or 'Show Labels') context menu option. The icons in the page then 'wrap' within the page, without text labels. When you hide the labels, you can display the label of an individual element or relationship by moving the cursor over the icon. Select the 'Pin in Toolbox' context menu option (not available on the 'Common' page, which displays all the time anyway). For example, if you 'pinned' the expanded 'Class elements' page, and switched to the 'Communication' pages, the Toolbox would include a collapsed 'Class elements' page below the 'Communication' pages. You can also pin a 'SysML Common' page to the Toolbox, simply by making the SysML 1.4 Technology the Active technology for your work login. To unpin the expanded page so that it displays only in its own Toolbox group, select the 'Unpin from Toolbox' context menu option. To collapse a page to just show the heading (<type> elements, <type> Relationships or Common), select the 'Collapse the current branch' option. Alternatively, click on the page name. To expand the page again, click on the page name. On the context menu, click on the 'Set Toolbox Visibility' context menu option. The 'Pinned Toolbox Pages' dialog displays. By default, the dialog lists the element pages only, in alphabetical order. 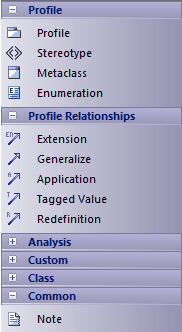 To include the corresponding relationship pages, select the 'Show Relationship Pages' checkbox at the bottom of the dialog. For each page to display on the Toolbox, select the 'Pinned' checkbox. Deselect the checkbox if you no longer require a page to be displayed. When you have defined the list of pages to display, click on the OK button. The pages you have selected are pinned to the Toolbox in a collapsed state, underneath the current diagram-type pages. To expand a page, click on the heading. To remove an individual page, expand it, right-click on it, and select the 'Unpin from Toolbox' option.